The Alumni Day 1999 of the Faculty of Medicine, NUS, was celebrated by two key note addresses, a poster exhibition on continuing education and medical research in NUS, and a lunch hosted by the Alumni Association. In the afternoon, the medical alumni joined in the campus-wide celebrations. The two keynote addresses, one from the Dean, Prof Tan Chor Chuan on the new curriculum and the other from Dr Wong Sze Tai, President of Alumni Association, on the future directions of the Alumni Association were good signposts into the immediate future. In this issue, we publish Dr Wong’s keynote address on the new directions of the Alumni Association. I would like to thank the Dean, Professor Tan Chorh Chuan, for so kindly inviting me to speak on this occasion. It is a great honour and privilege for me to have the opportunity to address you and share with you some of the pressing issues confronting the Alumni Association and the new directions that it will have to consider taking as it enters the new millennium. The Alumni Association will turn 76 years old tomorrow. I am happy to report that it is still fit and active as ever ministering to its members, the alma mater, the local community and the nation. With its long and illustrious history, the Alumni is looking ahead to face new challenges and opportunities in the 21st century. While we can justly be proud of our heritage and achievements, we should, nevertheless, be vigilant and able to pick up early signs of trouble that would adversely affect our work and growth. For some time now, a number of senior members of the Association have voiced concern about certain disturbing trends that could portend the decline of the Association and may even threaten its survival. Unless we start addressing these issues now we would have no hope of emulating the spirit of the alumni of top universities like Harvard and MIT. Let me first describe some of these trends before going on to how we can best tackle them in the new millennium. Recently, a senior member has voiced his disquiet about the diminishing lunch crowd in the Members’ Room at the Medical Centre and suggested that the Management Committee should organise interesting lunch talks once a month on a Saturday to attract the crowd back. I have great respect for this senior member for he normally would not raise the alarm without giving much thought to it. What has gone wrong? There are many speculations as to why this trend has come about of late. The consensus seems to be that something is lacking to attract the members to come more frequently for lunch at the Medical Centre. This is a real pity as the lunches in the Members’ Room are designed to provide the opportunity for members to interact and bond with one another. They also provide an opportunity for young doctors and medical students to meet their seniors in an informal setting so that they can exchange views, explore ideas, share experiences, acquire new knowledge and social skills, and derive inspiration, advice, opportunities for career development and good models worthy of emulation. What is alarming is the decline in the number of new members joining the Association over the last decade despite the fact that we have a new Medical Centre. As shown in Table 1, there has been a big decline in the number of new members joining the Alumni, from a height of 139 in 1989 to 18 in 1998. A special concern for the Alumni is the perception that young graduates nowadays are generally reluctant or disinterested to join the Alumni. If this were to go on, it would be bad for the Alumni. Already there is a distinct worry that the old guard cannot be expected to continue running the Association. An infusion of younger blood is needed to add vitality, new ideas, new leadership and a new image to the Alumni. This is an important issue as the Alumni’s chief concern is to remain relevant and responsive to the changes of time. To do this, it has to constantly renew itself and this can only be achieved by having more young members to join the Association and participate actively in it. As can be seen in Table 1, young graduates below the age of 40 years make up the largest number of new members. Over the last few years, there has been a marked decline in their numbers. This is a matter of great concern to us. Looking at Table 2, we can see two peaks – one in the year 1990 and a smaller one in 1997. Both peaks coincided with the increased efforts by the Management Committee to collect arrears from members who have defaulted subscription payments for over a year. 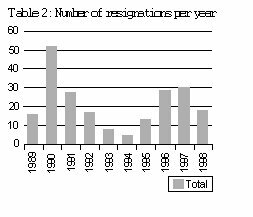 The number of resignations per year is not small compared to the new admissions. Last year, there was actually an excess of resignations over new admissions. The surprising finding is that the resignations come mainly from the younger graduates. This is a worrisome trend that needs to be looked into. When the Management Committee tried to find out informally why so few young graduates are joining the Alumni and why some have actually resigned, the comments from the young doctors were quite negative. For example, they would say “We thought it was an old alumni’s club” or “The programmes don’t suit us”. Both of these comments are examples of the “push” factor repelling the young graduates away from the Alumni. Other feedback from the young graduates include comments like “What value do I get from joining?” or “I have other clubs to go to with better facilities than those of the Alumni”. The last two examples serve as the “pull” factor drawing the young graduates away from the Alumni. Be it the “push” or “pull” factor, the Alumni must address such negative perceptions vigorously in order to create the right environment to induce the young graduates to join the Alumni. Well, so much about warning signs. Let me now turn to some speculations about why and how these threatening signs come about. We simply have to strive harder to foster closer ties and better bonding between the academia and the Alumni, and between the undergraduates and the Alumni, even though their locations are further apart now compared to before. We have to be more involved at a deeper and broader level than what we are doing at present with joint activities like the Orientation, the White Coat Ceremony, Graduate Tea Party and NUS Medical Society Excellence Awards. The Alumni looks forward to sharing an even closer and active working relationship with the Dean and with student leaders in the years ahead. In response to the aforesaid perceived threats to the Alumni’s survival and future growth, we have recently formed the Young Alumni Chapter that comprises of members aged 40 years and below. Our hope is that the Alumni Association, through the Young Alumni Chapter, will go through a process of renewal that will enlarge its base, strengthen its structure, enhance its performance and further satisfy the needs of our members. More than 2,300 survey forms were mailed out. This represents close to 100% of the cohort. Slightly more than 250 responses were received. This amounts to a response rate of slightly over 10%. Although there are limitations due to non-response, the team of three postgraduates from the Dept of Social Work and Psychology whom we employed to analyse the responses, feel that the response rate is acceptable, and that the results obtained would enable the Alumni Association to draw statistically meaningful conclusions. 18.1% of the respondents are current members of the Alumni Association. The remaining 81.9% are non-members. 86.4% of the respondents are aware of the Alumni Association. Most of them came to know about the Association through print materials. The most frequent response is “It is mainly for senior alumni”. 12. How should the Alumni Association’s image be enhanced? 13. How to attract new members? 14. Should the Alumni Association tie up with other associations, clubs and societies that share similar interests? The majority (72.8%) of the respondents agreed that the Alumni Association should tie up with both local and foreign associations, clubs and societies that share similar interests. 15. Provision of social opportunities for young single members to interact eg. setting up a social introduction service. 16. Should the Alumni Association upgrade its facilities to that of a social or town club? Most respondents answered “yes” to this question. 17. Would you join if the Alumni Association has facilities similar to those of a social or town club? Lastly, 83.3% of the respondents indicate that they would like to know more about the Alumni Association. Data from the Alumni Association’s database and the Millennium Survey has confirmed our observations and fears – that the number of graduates joining the Alumni is declining, and the bulk of the decline and resignations comes mainly from the young graduates. All this is rather bad news, but the survey data has given us new information to guide us on planning what new directions to take in future to overcome these problems. On the positive side, the survey reveals that the great majority of young graduates want more information about the Alumni Association and that a substantial number of them will join the Alumni if it provides value. There is yet hope of a turn-around in the fortunes of the Alumni. That is why we have taken a bold step in forming the Young Alumni Chapter. Although this is new for us, it is not so with the alumni of the top universities in USA. A search in the Internet shows that the alumni of practically all the good universities in USA already have established their Young Alumni Chapter long before us. As regard its strategies for the new millennium, an adaptation of the University of Michigan Alumni Association model appears to be a useful option. Basically the “Michigan” Model segments its alumni into four categories defined by life stage, taking into account their age, family status, professional status, their needs, their interests and their means to participate (eg time, money etc). Its philosophy is that each category has its own features and needs, and that the services provided for each category have to be relevant, meaningful, value-added and tailored to their needs. Members of this group are largely concerned with graduation, employment and finances. Members of this group are most interested in career development programming, finances and marriage. Members of this group generally have children and are interested in information technology. The members of this group generally have the most free time and are interested in a wide variety of subjects and seek to be exposed to new ideas. The Alumni Association has taken its first step in forming the Young Alumni Chapter to cater to the undergraduates and young graduates who have graduated within the last 10 years. It will follow up the findings of the Millennium Survey and plan practical, value-added, meaningful programmes relevant to the needs of undergraduates and young graduates that will promote their active participation in the Alumni. It should subsequently conduct surveys of the other categories of alumni and plan appropriate meaningful value-added services for each of these categories based on their needs. The Alumni Association will have to intensify its efforts in promoting bonding with the undergraduates and the alma mater in the coming years. Except for the last category, all the other categories’ entrance fees have been greatly reduced. The monthly subscription at present is only $12.50 per month. That is really cheap and great value for money. We are also in the process of working out a special category for the undergraduates. O Using different approaches to serve all age groups of alumni based on their needs. O Being flexible and able to adjust quickly to changing market needs. The present Management Committee will soon be forming a special committee to study the feasibility of eventually upgrading the Association into a social or town club in our follow-up of the results of the Millennium Survey. This matter is of some importance to the Association as it has not been assured of its continuing use of the present premises after the next five years. O Restructuring the Alumni Association towards a customer-focused organisation. The strategies and projects that I have mentioned above will need several years at least to implement. The Alumni Association has one problem – ie. its Management Committee is required to change every year according to its constitution. The problem notwithstanding, let’s hope that the Alumni will achieve success in the new directions that it has set for itself for the coming years.